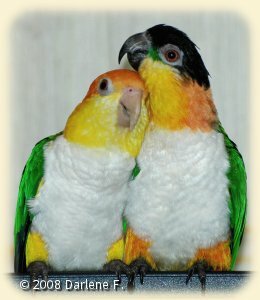 A unique quality about Caiques is the fact that two (or more) can be kept together as pets. With many other species of parrot, a pair will form a strong bond and exclude their human caretaker. Caiques are the exception to this rule. I have found that when a young Caique joins a household with other pet birds they often get along with the resident birds. The reverse is not true, many adult Caiques will NOT accept new birds unless they happen to be another Caique. Caution must be always be advised regarding interaction with other birds. My own pet Black-headed Caique attacked and killed my pet Grey-cheeked Parakeet. She also injured a Quaker Parakeet, almost her own size. Very often a Caique will be aggressive toward a much larger bird with no regard for their size difference. Extreme caution must be exercised at all times. Do not allow your Caique to be unsupervised around other birds.